Starting a new business? Come and join us as we discuss how and where to begin. We’ll share a checklist of pre-startup activities and first steps presented in the sequence most beneficial to your business and help you prioritize tasks. At the end of the session you will have the opportunity to ask your specific questions about starting a business. Who Should Take this Class: Anyone who is starting or thinking about starting a for-profit business, especially those who would like clarity about where to begin and how to proceed. Also a great class even if you’ve already started your business but want to make sure you didn’t misss anything in the start-up phase. Are you receiving Social Security Disability benefits and interested to know about how starting a business or working will affect your benefits? If so, you can attend free online webinars. Have you heard of the PASS program? If you are receiving Social Security Disability benefits the Plan to Achieve Self-Support (PASS) program lets you set aside money and/or things you own to pay for items or services you need to achieve a specific work goal, including becoming self-employed. If you are applying for the PASS program and your work goal is to start a business, along with your application you are required to submit a supplemental business plan describing your business idea. This course will walk you through the process of refining your business idea and, step-by-step, writing your business plan document, including all the elements as required by the Social Security Administration (SSA). The goal for this course is to complete a final draft of your business plan for submission to the SSA. A free business plan review is included for alll who complete the course. Check back soon for a new classes, or SIGN UP HERE to find out whenever new classes are added! Amazing Biz + Life Academy The Amazing Biz + Life Academy is a premier resource for women wishing to create amazing lives + businesses. It is a deeply-powerful success library jampacked with resources to transform your business + life to Level Amazing. You’ll receive business + marketing training, audio meditations, illustrated workbooks, e-courses, tips + access to a mastermind of almost 3,000 women. The Academy gives you everything you need to live, work, play + create like the Amazing Woman you were born to be! Marie Forleo’s B-School B-School is an online business school for modern entrepreneurs. This 8-week online training program teaches you how to use smart online marketing to fuel both higher profits, and your higher purpose. You’ll learn step by step how to package, position and sell your products and services using modern tools of entrepreneurship. Website Creation Workshop Are you ready to learn how to build a website that’s easy to create and that YOU have control over? Knowing how to build a website for yourself releases you from the grips of your webmaster! This hands-on, VIRTUAL workshop shows you step-by-step exactly how to build your website from the ground up using WordPress. You’ll have the support of Internet Marketing expert Christina Hills & her professional team throughout the program. Check it out. Right-Brain Business Plan e-Course Have you tried to do a business plan the “traditional way” and you got stuck, overwhelmed, and demotivated? Want a fun and creative way to plan for your entrepreneurial success? 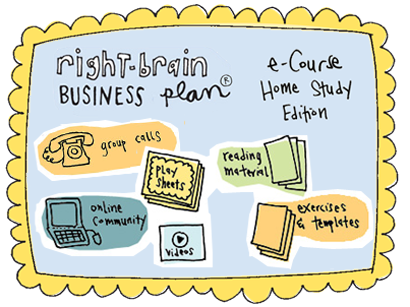 Then join the party at the Right-Brain Business Plan® Home Study e-Course. You’ll roll-up your sleeves and craft a visual plan that lets your head know where your business is going AND inspires your heart to sing with joy. Since it’s a home study program, you get to start whenever you want and you get to do it all on your own time! Not sure you’re ready for the course? Buy the Right-Brain Business Plan book from our Book-tique.